KawaiiPunk - Kawaii Mascot Blog: Kawaiification! Lovely Lighting! Yes, it’s a kawaiified light switch! You see, while I’d planned for a summer of kawaiifying joy in the open air, it turned out my wife had planned for a summer of DIY! And as the sun shone down and the birds sung sweetly over the summer months I spent my days indoors up to my neck in paint and wallpaper paste! But, as you can see, all was not in vain! 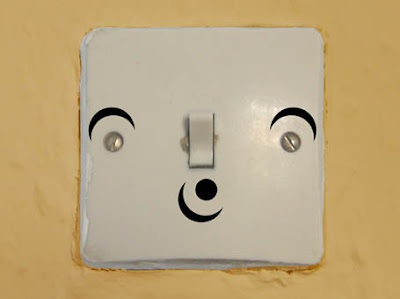 For during this time I did manage to happen upon this remarkable light switch that was just crying out for a kawaii makeover. I do hope you enjoy it! Incredible! Even when you’re busy doing DIY, you still find time for a spot of kawaiification! Mr. Justice Smithering Smythe (retired) - you are an inspiration to us all!